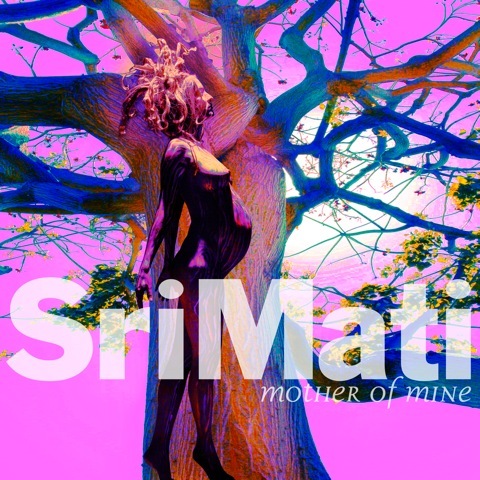 I am beyond proud to announce that today my beautiful and wildly talented wife released her first official offering as a musician, her debut album entitled “Mother of Mine” by SriMati (aka Julie). If you read my book (or this blog with any regularity), then you know that I revere Julie – she is a powerhouse, talented in countless disciplines, and a master of manifestation among many other amazing qualities. So it is only appropriate that she offers her music under the name SriMati, which loosely translated means blissful, beautiful, fortunate, spiritual knowledge and power. During the course of her life, Julie has graced runways as both a fashion model and designer of haute couture as impresario of her own self-titled label. Her paintings and sculptures grace the walls of many offices and homes, including our own — a modern abode she conceived, helped design and literally built from nothing but a plot of untouched land. A natural healer, she has sat at the feet of many a master. And passed on her accumulated curiosity and wisdom by helping countless others embrace faith and a deeper inner peace. Expert at identifying and unlocking the authentic spirit all too often lying dormant within, she has been instrumental in facilitating my own transition, and that of many others. A born leader and magnetic pied piper, she has transformed our home into a veritable salon experience, creating a community of “Jai” by virtue of our ever-revolving open-door policy, enriching us and our children with a constant and intimate rotation of dynamic guests — some of the most interesting and brilliant forward-thinking people I have ever met. Not enough for you? She’s also an expert vegan chef (if you haven’t already, check out our digital e-cookbook JAI SEED – the recipes are hers) and a partner in a new startup called BEELOVED focused on educating children on the importance of bees in the ecosystem. Oh, and I almost forgot — she is home schooling all 4 of our children (both Julie and I will be writing more on this very important subject in coming months). Don’t ask me how this is possible. It defies the time-space continuum. And yet she is beyond successful in everything to which she devotes her spirit and formidable mind. Let’s just say I married the right woman. Julie bought our son Tyler (17) his first guitar when he was 5, and he has never since put it down. When she noticed Trapper tapped with perfect time, she rewarded him with a drum kit – he was 7. Neither of them has ever looked back. And now our garage has morphed into a full-blown professional rehearsal studio, complete with every instrument under the sun and an unimaginable amount of equipment – mixing boards, half a dozen amps, a rack of guitars and pedals, a piano, keyboards, and even something called an “esraj”. Last year we disconnected our DirecTV and now our home is constantly filled with music at all hours of the day and night – everything from rock to classical – and with the persistent dedication of mentor and producer Jimmy Hori, original compositions of incredible quality emanate from the garage with consistent regularity, flooding our home with melodious joy. It may be cliché, but it is truly a modern-day “Partridge Family” scenario, save the colored bus (I’m working on it). Let’s just say I’m the Rubin Kinkaid in this equation – albeit one who likes to ride a bike. Several years ago, alone with her beloved antique harmonium – a present to herself she felt compelled to pick up during an overnight pilgrimage to Paramahansa Yogananda’s Self Realization ashram in Encinitas – Julie began to channel songs. Despite the fact that she was never formally trained, she fell in love with writing & voice – stepping into a new medium to express her intrinsic fount of relentless artistic energy. And it wasn’t long before she had a catalog of beautiful songs she began to persistently workshop and refine, both alone and with the boys, later joined by our nephew Harrison (19), all of whom eventually collaborated comprise her band. It’s in the genes. Julie’s brother Stuart Mathis has played and toured with everyone from Jewel to Five For Fighting to Lucinda Williams and LeAnne Rimes and is currently the lead guitarist in The Wallflowers. Julie shares the coveted DNA with all three boys, who play a wide array of instruments on Mother of Mine – everything from background vocals, to guitar to piano, bass, harmonium, keyboards, and percussion. Only 15 when the project officially began, Tyler actually produced the album, and is responsible for many of the intricate arrangements, mature well beyond his adolescent years (watch out for their band Farthingale – a Nick Drake meets Radiohead mashup – they are currently booking gigs around LA and are headed into the studio this summer to record their first album). While I trained, they rehearsed. While I worked, they recorded. Many quality hours tending to my little girls so that Julie could spend late nights in the studio, in manifestation of her dream. It’s been a long road for her – countless iterations of her songs heart-tested developing her voice and unique sound to unlock the most authentic version of personal expression. Very much like my pursuit of Ultraman, or the writing of my book, there was copious toil. Plenty of sweat and fleeting moments of doubt and disorientation. Band battles and many tears along the way. But always love. Always love. And now here we are. In the same way that Finding Ultra is a material manifestation of a very personal hard-wrought journey of personal transformation, as is Mother of Mine for Julie – a deeply intimate and beautifully eloquent expression of a very difficult and long road traveled. The chronicle of a spirit elevated. And the symbol of a human now fully expressed, blossoming. I could not be more proud. Watching Julie tap into her heart to evoke what she deems one of the most meaningful experiences of her life has been a joy and a privilege to watch – again, a journey in so many ways a mirror image of my own. A dream that was not easily achieved, yet tenaciously fought for. And to have chosen to pursue this mission with her boys has created a bond of intimacy with her children that can never be broken, permanently enriching all of our lives beyond measure. But before you listen, please read Julie’s (SriMati’s) personal account of how the music was born – it’s as lyrical as her songs. Then…… LISTEN. And fall in love.